Fair well to 2013 soon it will be 2014. It is that time of year gifts are being purchased and made, and it is always wonderful to receive a handmade gift, there are so many great things to give. Some can be expensive some may not. We all are here to give you ideas for all occasions that you may be giving to another. I am your host today, Lissa here at So Many Crafts, So Litte Time. I hope you enjoy our hop we will go out with a bang and bring you new things next year. Today I am showing some different gifts you can make using vinyl. The first two metal signs were purchased at Hobby Lobby. I simply added the phrases from the Silhouette Online Store that I cut out in black vinyl. I tied a tulle bow to the wire on top. These make great gifts especially to young couples who may not have a lot of decorations yet. 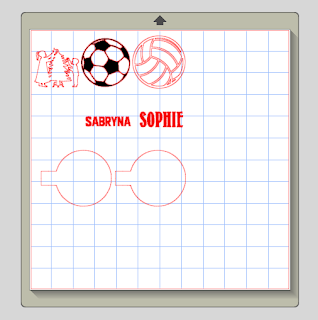 You can also personalize them with their names. I took a 12 x 12 black metal frame from Michaels and added a Christmas piece of scrapbook paper inside. I cut the image (also from the Silhouette Online Store) and cut it out of black vinyl. I applied the vinyl to the glass of the frame. I love using these 12x12 frames for home decor! Sometimes, I remove the backing and hot glue the glass to the inside of the frame. I put the vinyl on the glass and the wall shows through. And now, onto the Blog Candy!!! For today's blog candy Lissa is giving away a $10.00 Gift certificate to anywhere you choose that she can purchase online and send the gift card to you online. Preferably you will choose Close to My Heart for a Studio J layout but this is the time to give and she would like to give what you like to receive so good luck to every new and old email follower (required to win the certificate) and commenter who comments on the hop, hoping you make an effort on all the blogs. 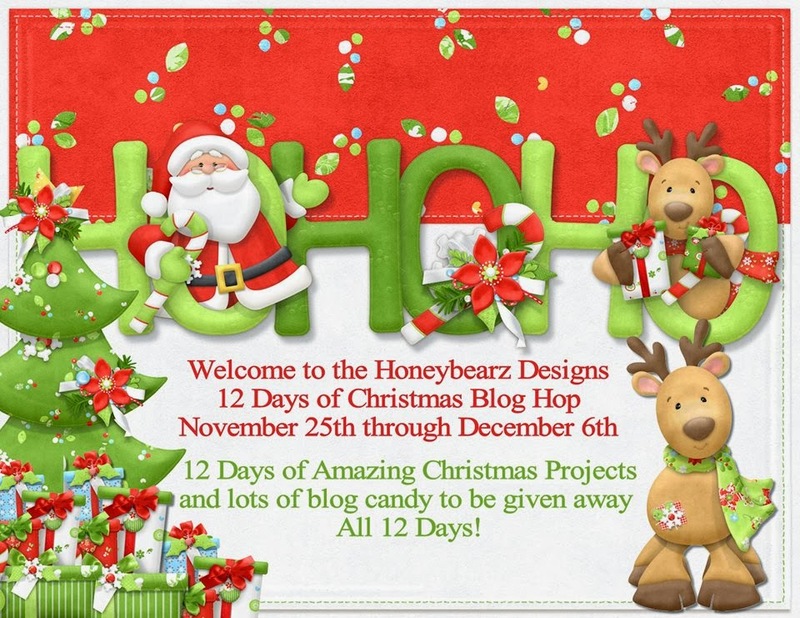 Welcome to Day 6 of the Honeybearz Designs 12 Days of Christmas Blog Hop! We are half way there - many more projects to come!!! My tag is also being featured today at Frosted Designs! If you arrived from Lucy, you are in the right spot. If you found me first, head over to the BEGINNING so you can see the blog candy as well as everyone's projects!! Welcome to the 12 Days of Christmas Blog Hop. This hop will take place November 25th through December 6th and the new postings each day will be posted by 8 am eastern standard time. This hop will be full of wonderful ideas and inspiration to get you well on your way of creating all of those beautiful Christmas project. This is an awesome way to get a lot of your Christmas cards, and scrapbook layouts finished, home decorations completed and maybe even be inspired to create something using a new technique that you have never tried. There will be a new project posted each and every day by all the wonderful amazing ladies in this hop. Also each day we will have a guest designer or two for you to visit. Lisa our hostess will be giving away some wonderful blog candy each day of the hop from the amazing sponsors that we have for this hop. Lisa will be posting all the winners from this hop on December 10th. Every one has a chance to win including the ladies participating in the hop and even the guest designers and the sponsors. At the end of each post we will have a list of all the sponsors who are sponsoring this hop all you need to do is click on their name to go to their sites and check out all the wonderful sites. We want to thank each and everyone of the sponsors for their generosity. It has been greatly appreciated. Pazzles - Two digital download gift cards for a Cutting Collection of choice. Today I am sharing a fun tag that I made using products from my friend's store Frosted Designs. and sprayed it with Cherry Pie Dylusions Ink. I punched two holes and tied some 3 Girl Jam ribbon with a flower to the top of my punch. I adhered a tiny heart from Um Wow! to the bottom corner. Your next stop is Beth's Blog! Hello and welcome to Day 5 of the Honeybearz Designs 12 Days of Christmas Blog Hop!! Today I created some ornaments for my nieces using the floating ornament technique. I sized a soccer ball and a volleyball to fit the insert for my glass ornament. I also created their names and sized them to fit across each ball. I cut the balls out of black vinyl. I cut their names out of red vinyl (team colors). I cut the ornaments shapes out of acetate using the Rhinestone Template setting on my cameo. I put the ball on one side of the acetate, and the name on the other. I trimmed the top of the acetate off because it was too tall and would stick out the top of my ornament. You can see the black volleyball is on the back side. I rolled the acetate around a pencil and slid it into the ornament. Instead of putting the names on the acetate, you could have put them on the outside of the ornament. I added ribbons in her team colors to the top. I did the same with Sabryna's ornament using the soccer ball and her name. The acetate could have been a tad bit smaller. I made Sophie's first and you can see it the acetate is not lying flat inside the ornament. I trimmed Sabryna's a tiny bit and hers lays flat. 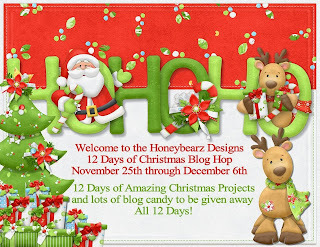 Welcome to Day 4 of the Honeybearz Designs 12 Days of Christmas Blog Hop!! Today I am showing you my Christmas Mini Albums I made to give as gifts. I love making gifts!! I started out with 4 pieces of chipboard per album. I cut them to 5x7. I used paper from Chrismas paper pads I found at Hobby Lobby. I like that the paper coordinates. I trimmed 4 pieces of paper so I had 2 of each kind for my album. I found this title in the Silhouette Store and cut it out of black vinyl. I adhered it to the front of each album. I trimmed photo mats 6.25 x 4.25. Christmas photos are generally busy and bright, so I wanted a simple album that would not compete with the photos. On the back, I put santa and his reindeer, also from the silhouette store. I used my Crop-A-Dile to punch two holes in each page and secured with binder rings. I tied some coordinating ribbon on the rings. I made each album a little different. I can't wait to see what memories are placed inside! !